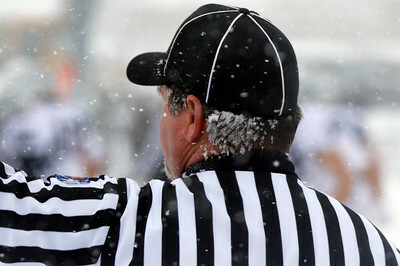 H. Rick Bamman - hbamman@shawmedia.com The windward side of a referee's head is caked in snow at the Class 7A semifinal in Glen Ellyn on Saturday, Nov. 21, 2015. 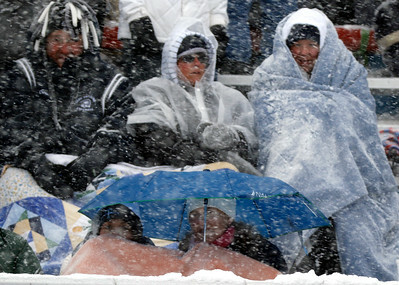 H. Rick Bamman - hbamman@shawmedia.com Cary-Grove fans watch as the Trojans are defeated by Glenbard West 21-6 in the Class 7A semifinal in Glen Ellyn on Saturday, Nov. 21, 2015. 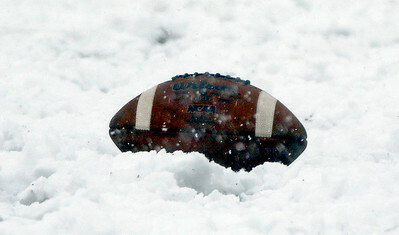 H. Rick Bamman - hbamman@shawmedia.com A football sits in the snow before being put into play in the Class 7A semifinal in Glen Ellyn on Saturday, Nov. 21, 2015. 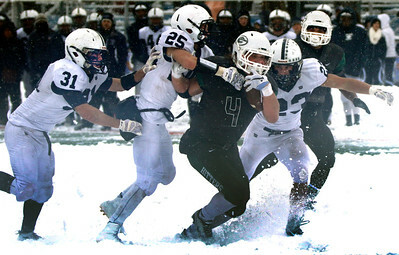 H. Rick Bamman - hbamman@shawmedia.com Cary-Grove running back Robbie Gleeson runs into the Glenbard West defensive line including defensive back Justice Bradley (24) in the fouth quarter in the Class 7A semifinal in Glen Ellyn on Saturday, Nov. 21, 2015. Cary-Gove fell to Glenbard West 21-6. 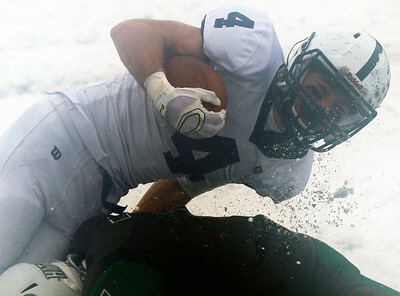 H. Rick Bamman - hbamman@shawmedia.com Cary-Grove running back Ryan Magel escapes the grasp of Glenbard West linebacker MArk Mattson in the first half in the Class 7A semifinal in Glen Ellyn on Saturday, Nov. 21, 2015. 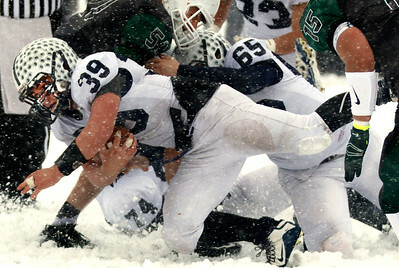 H. Rick Bamman - hbamman@shawmedia.com Cary-Grove full back Tyler Pennington grinds out a first down in the second quarter against Glenbard West the the Trojan's 21-6 loss in the Class 7A semifinal in Glen Ellyn on Saturday, Nov. 21, 2015. 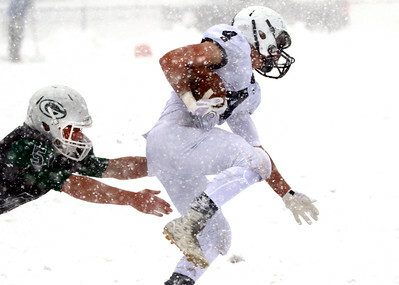 H. Rick Bamman - hbamman@shawmedia.com Glenbard West Danny Riley hits Cary-Grove running back Ryan Magel in the fourth quarter in the Class 7A semifinal in Glen Ellyn on Saturday, Nov. 21, 2015. Cay-Grove lost 21-6. H. Rick Bamman - hbamman@shawmedia.com Cary-Grove full back Tyler Pennington runs for the endzone for the Trojan's only touchdown against Glenbard West in the Class 7A semifinal in Glen Ellyn on Saturday, Nov. 21, 2015. H. Rick Bamman - hbamman@shawmedia.com Cary-Grove linebacker Tyler Pennington (hidded) and defensive lineman Alex Prendergast work to contain Glenbard West running back Sam Brodner in the Class 7A semifinal in Glen Ellyn on Saturday, Nov. 21, 2015. Gary Grove fell 21-6. 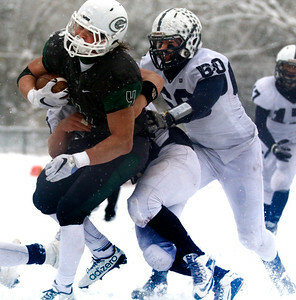 H. Rick Bamman - hbamman@shawmedia.com Glenbard West linebacker Mark Mattson brings Cary-Grove running back Kyle Pressley down in the fourth quarter in the Class 7A semifinal in Glen Ellyn on Saturday, Nov. 21, 2015. Cary-Gove fell to Glenbard West 21-6. H. Rick Bamman - hbamman@shawmedia.com Cary-Grove defensive backs Max Skol (31), David Daigle (25) and James Freskos (23) work to contain 21-6 Glenbard West running back Sam Brodnerin the fourth quarter during the Class 7A semifinal in Glen Ellyn on Saturday, Nov. 21, 2015. Cary-Grove lost 21-6. H. Rick Bamman - hbamman@shawmedia.com Cary-Grove quarterback John Sullivan calls out the play in the first half against Glenbard West in the Class 7A semifinal in Glen Ellyn on Saturday, Nov. 21, 2015. 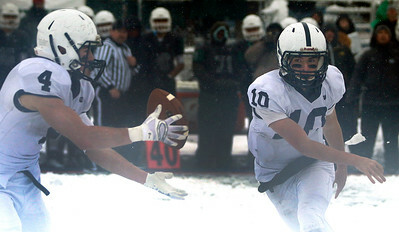 H. Rick Bamman - hbamman@shawmedia.com Cary-Grove quarterback John Sullivan pitches out ot running back Ryan Magel in the fouth quarter in the Class 7A semifinal in Glen Ellyn on Saturday, Nov. 21, 2015. 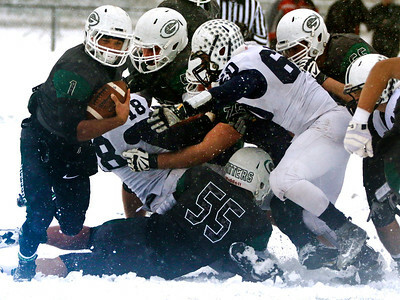 Cary-Grove fell to Glenbard West 21-6. 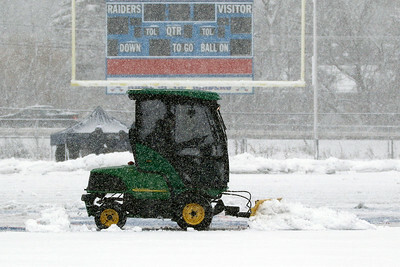 H. Rick Bamman - hbamman@shawmedia.com Glenbard South High School crews work to clear the field before the start of the Class 7A semifinal in Glen Ellyn on Saturday, Nov. 21, 2015. H. Rick Bamman - hbamman@shawmedia.com Cary-Grove defensive backs Max Skol (31), David Daigle (25) and James Freskos (23) work to contain Glenbard West running back Sam Brodnerin the fourth quarter during the Class 7A semifinal in Glen Ellyn on Saturday, Nov. 21, 2015. Cary-Grove lost 21-6. H. Rick Bamman - hbamman@shawmedia.com Glenbard West's Jake Dayton (42) Robby Bystry (40) and Yanni Pappas (23) celebrat the 21-6 win over Cary-Grove 21-6 in the Class 7A semifinal in Glen Ellyn on Saturday, Nov. 21, 2015. H. Rick Bamman - hbamman@shawmedia.com Glenbard West's Sam Brodner reacts to his second half touch down against Cary-Grove in the Class 7A semifinal in Glen Ellyn on Saturday, Nov. 21, 2015. Glenbard West won 21-6. 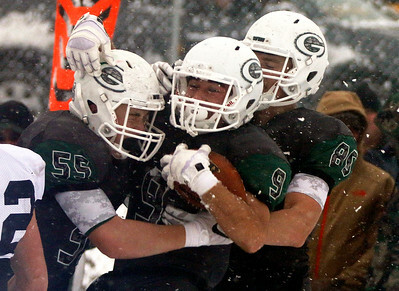 H. Rick Bamman - hbamman@shawmedia.com Glenbard West's Will Farley (55) and Alex Pihlstrom (80) celebrate Adam Zybko's (9) touchdown against Cary-Grove in the Class 7A semifinal in Glen Ellyn on Saturday, Nov. 21, 2015. 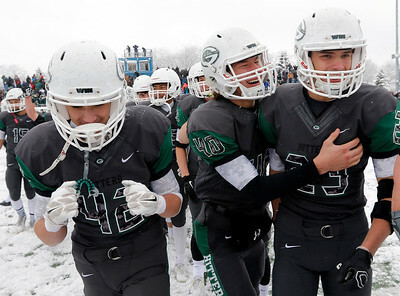 Glenbard West went on to win 21-6 and advanced to the state final in DeKalb. 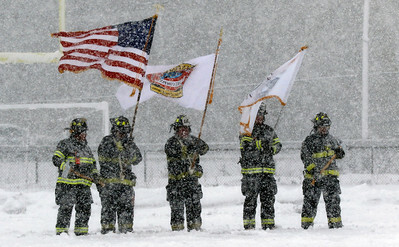 H. Rick Bamman - hbamman@shawmedia.com Glen Ellyn firefighters present the colors during the National Anthem before the start of the Class 7A semifinal at Glenbard South High School in Glen Ellyn on Saturday, Nov. 21, 2015. 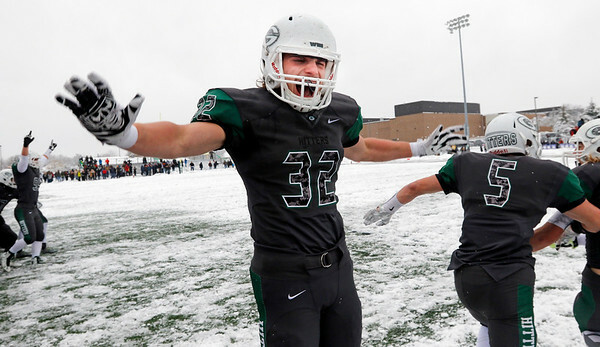 H. Rick Bamman - hbamman@shawmedia.com Glenbard West senior running back George Mugnani celebrates the Hilltoppers 21-6 win over Cary-Grove in the Class 7A semifinal in Glen Ellyn on Saturday, Nov. 21, 2015. H. Rick Bamman - hbamman@shawmedia.com Glenbard West's senior running back Isaiah Skinner bounces off the pile at the line to run for a first down in the second half against Cary-Grove in the Class 7A semifinal in Glen Ellyn on Saturday, Nov. 21, 2015. 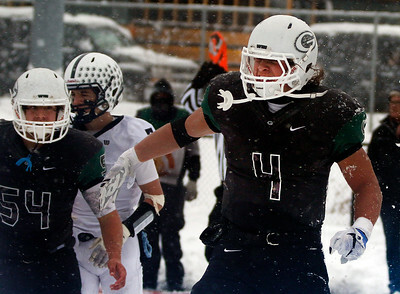 Glenbard West advanced to the state final in DeKalb with a 21-6 win over Cary-Grove. 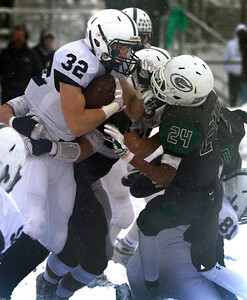 Cary-Grove linebacker Tyler Pennington (hidded) and defensive lineman Alex Prendergast work to contain Glenbard West running back Sam Brodner in the Class 7A semifinal in Glen Ellyn on Saturday, Nov. 21, 2015. Gary Grove fell 21-6.